In this post, we are going to discuss one basic concepts of quadrilaterals. 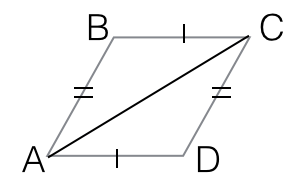 That is, if we have a quadrilateral, and the opposite sides are congruent, then these opposite sides are parallel. This is the same if the two opposite sides of a quadrilateral are congruent, then the quadrilateral is a parallelogram. Consider the quadrilateral below. The lengths of AB and CD are equal. Also, The lengths of AD and BC are also equal. So, we are going to show that these pairs of sides are parallel. Theorem: If the two pairs of the opposite sides of a quadrilateral are congruent, then they are parallel. What we want to show: and . From the given (Side) and (Side). Therefore, by the Side-Side-Side or SSS congruence theorem, triangles and are congruent. So, because they are corresponding angles of the two triangles. Using the same argument, it can also be shown that (left as an exercise). 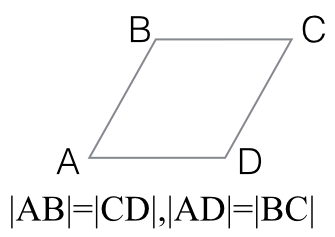 Therefore, if the two pairs of the opposite sides of a quadrilateral are congruent, then they are parallel.